Tommy John and Richard Caster at the NFL Alumni CT Chapter 6th Annual Charity Golf Classic at Country Club of Darien in Darien, Conn. on Monday June 18, 2012. DARIEN -- The last touchdown of Joe Morris' esteemed NFL career occurred in 1991, but the former star running back still scores to this day. Like many gridiron greats from yesteryear, Morris scores on the golf course these days with his trusty bag of clubs, and it's always for a good cause. 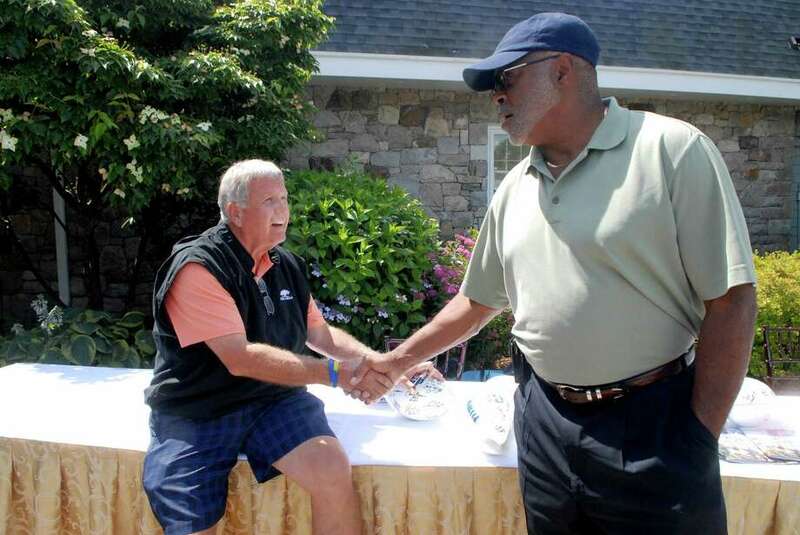 One of the New York Giants' all-time great running backs, Morris joined more than 20 former NFL players at the Country Club Of Darien Monday with the motto "Caring for Kids" in mind. The distinguished group of sports celebrities teed off to support the NFL Alumni Connecticut Chapter's sixth annual Charity Golf Classic. "I enjoy competing in events like this," Morris said. "You get to see some old teammates and guys that you played against with an opportunity to play for a great cause." The event, which takes place at Country Club of Darien each year, featured an 18-hole scramble tournament in which each foursome was led by a former or current NFL player, an awards dinner and a silent and live auction. All of the money raised benefited children's charities in the state. "We have had a great response from former players each year," said NFL Alumni Connecticut Chapter President Steve Thurlow, a running back for the Giants and Redskins from 1964-68. "Each year, we have received good support from local sponsors and groups in this area. The last several years we've raised between $60-70,000." Darien Sports Shop once again served as the presenting sponsor, while companies such as Vineyard Vines, Thomas Reuters, Stamford Hospital Foundation, Mercedes Benz of Greenwich, Mohegan Sun, Phillips-Van Heusen and Tiffany & Co. were also some of the main sponsors. "Our motto, `Caring for Kids' has been a great success," said former Giants/Browns running back Randy Minniear, the NFL Alumni Association's chairman of the board. "We try to look for charities where the dollar goes right to the kids -- organizations where any type of donation can help make their year." Morris, who is holding his own charity golf event on July 9 in N.J., to benefit the Boy Scouts, said watching the Giants win the Super Bowl in February made him turn back the clock. "It definitely brought back some memories," said Morris, who helped the Giants win Super Bowl XXI in 1986. "I don't think a lot of people thought they were going to do it after they finished 9-7. But Eli Manning lifted his play so much during the postseason." A two-time Pro Bowl selection who rushed for 5,585 yards and 50 touchdowns during his career, Morris was known for being a smart player -- a reputation he earned from current Giants head coach Tom Coughlin. "When I was a freshman at Syracuse Coughlin was the offensive coordinator and running backs coach there," Morris said. "He taught me the game and how to read defenses." Morris vividly recalled his initial film session with Coughlin. "My first time with him we watched 25 plays in the field house at Syracuse, going through every play and how each and every player was moving and what his assignment was," Morris said. "It changed my opinion of how you do things. In the NFL, players asked me how I knew everyone's route and I told them about the college coach I had who told us to know everyone's position." Former Jets/Redskins tight end Rich Caster kept his eye on how Monday's event was organized by Kelly McCoy and Mark Yusko. "We're beginning a NFL Alumni Chapter out on Long Island -- we've been in existence for eight months," said Caster, a three-time Pro Bowl selection with the Jets. "Our chapter is planning a golf outing next year, so I'm here to learn a little bit and see how everything's going." A big Jets fan, Caster is glad to see the NFL cracking down on helmet-to-helmet hits. "We laugh at some of the stuff we see today in games because when we played we took some big hits to the head and no penalties were given," Caster said. "But I'm a big proponent for keeping the players safe. In today's game, we have to do what we can to give players the best chance to walk away from the sport healthy." Randy Rasmussen, a Jets guard from 1967-81, also follows his old squad. A Wilton resident, Rasmussen started for the Jets' Super Bowl III title team and was the last player from that game to retire. "It should be an interesting year for the Jets, especially with the addition of Tim Tebow," said Rasmussen, who works at Rand Insurance in Greenwich. "I think they will have a good role for him and I'm sure they'll work it out." Rasmussen always thinks of the Jets' championship win against the Baltimore Colts come Super Bowl time. "The week of the Super Bowl they play that game on TV so many times," he said. "You always see Joe Namath signaling `No. 1.' "
New York Giants second-year linebacker Mark Herzlich was near his old stomping grounds for Monday's event. "My mom grew up in Rowayton and my grandmother still lives there, so I was around this area a bunch growing up," said Herzlich, who planned to visit his grandmother after the event. "Being here for a good cause and meeting some of the NFL's alumni is a perfect situation." A starter at linebacker for several games before injuring his ankle, Herzlich knows his rookie season was one to remember. "It was really unbelievable the way everything came together," Herzlich said. "We basically had to win six playoff games, but we did it. Everyone on the team just played so well at exactly the right time." Former pitching great Tommy John was the only athlete at the outing that didn't play in the NFL. Yet John does have NFL ties. His son-in-law Patrick Mannelly is entering his 15th season as a long snapper for the Chicago Bears. "Whether it's football, baseball, basketball, getting guys together to raise money for charity is great," John said. "I'm competing in a golf event tomorrow for anti-bullying run by Chase Blackburn of the Giants. If you can lend your name to help raise money for a cause you should do it."